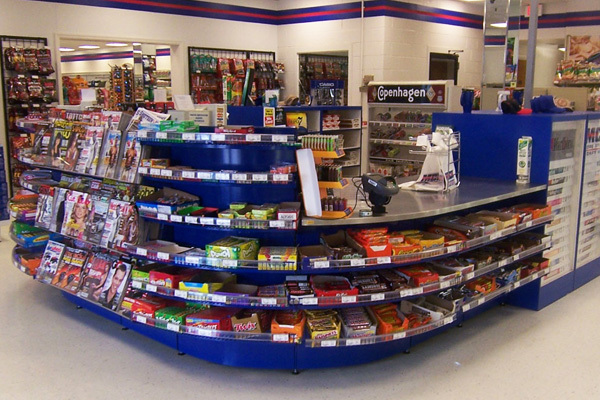 Checkout Counters, Sales Counters, Gondola Shelving, Custom Metal Cabinets, and much more..
At SHOPCO U.S.A., we are dedicated to providing our customers with the best customer service experience possible. 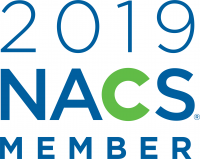 We take pride in our high-quality, versatile, and long-lasting retail merchandising systems which include Checkout Counters, Sales Counters, Metal Food Service Cabinets, Metal Sales Counters, and Gondola Shelving Systems and Madix Gondola Shelving. 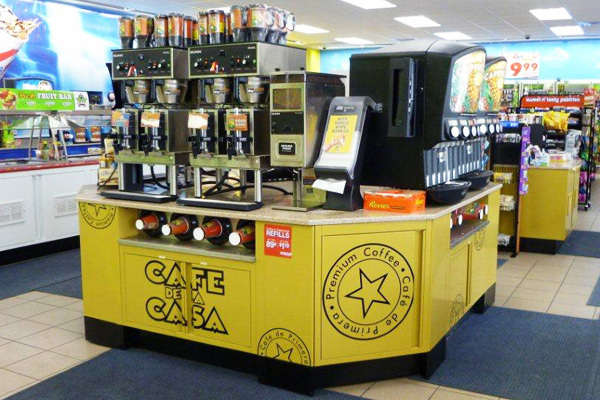 SHOPCO U.S.A., Inc. has developed an array of all-metal checkout counters & store fixture systems to tackle gondola merchandising requirements, food and beverage counter solutions, and the all-important sales counter presentation. 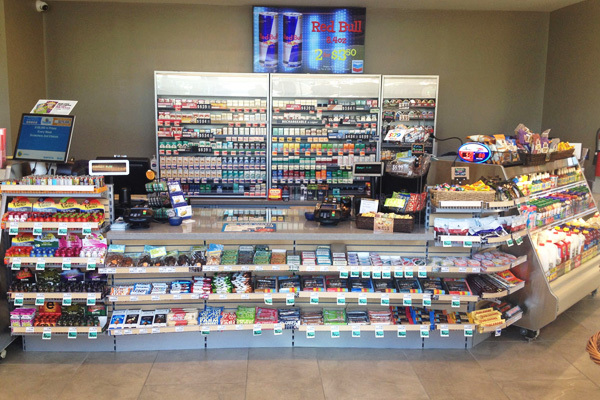 SHOPCO store fixtures are used in a variety of retail applications including convenience stores, grocery stores, supermarkets, and much more. The Gondola System comes in a variety of all-metal lengths, depths, and heights to meet all of your merchandising needs. Choose from metal, smooth, pegboard, slat wall, and mini-slat panels. Traditional or curved gondolas are available in stock and ready to ship in Black, White, and Beige. SHOPCO gondolas are constructed for quality and are powder-coated with electro-static technology to ensure longevity. SHOPCO U.S.A., Inc. offers a full line of all-metal cabinets with options such as prep, low prep, beverage, condiment, waste, and microwave units. These cabinets are ideal for quick-serve food service applications in convenience stores and restaurants. Our CAD team will assist you in designing your food service application for your store. The Sales Counter System is a unique component counter design. Design your sales counter to fit your customer’s specific needs while improving the efficiency of your service attendants. Our Sales counters provide retailers with the ability to increase their merchandising space while maintaining a clean and organized feel at the checkout. 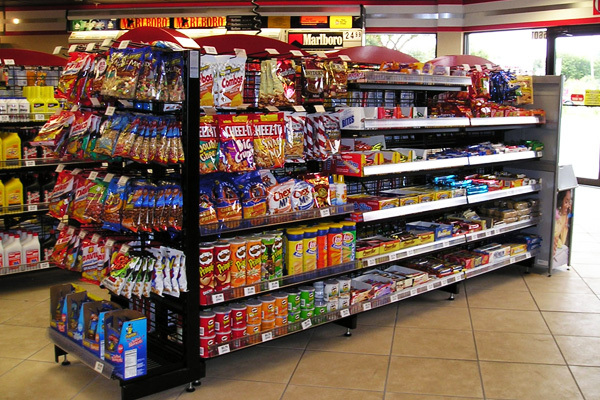 Increase your impulse sales with SHOPCO sales counters.